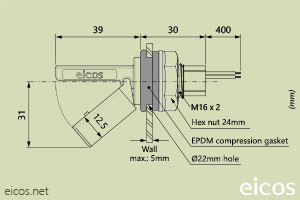 The Eicos level switch LF222E-40 is ideal for mounting in narrow passages and thin wall tank. 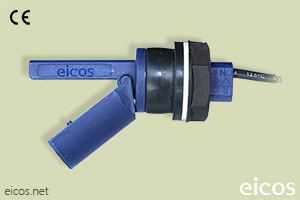 With this sensor is possible to monitor the liquid level in small tanks and pipes. 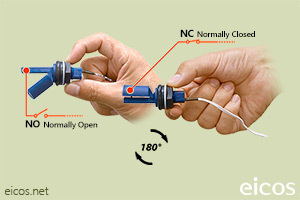 The sensor, also known as level detector, indicates by means of a ON/OFF signal when the level of liquid is reached. Mounting by the external side of the tank in Ø22mm hole and sealing by compression gasket (for tank with wall thickness up to 5mm). 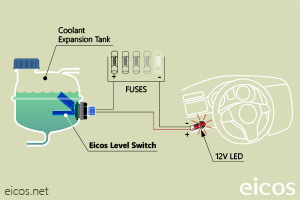 For each liquid level to detect, is needed to install a level switch. Output connection by 40 cm wire.